Their story shows how caring for the environment and love for the sea can reverberate. Blueye now employs 19 people, and Spiten is on the 2018 Forbes 30 under 30 list for Europe. “Two thirds of our planet is covered with water. Without healthy oceans you do not have a healthy planet. It shouldn’t be called Planet Earth, but Planet Ocean, and still we know less about the oceans than about the surface of Mars,” says Christine Spiten. Her title is now Co-Founder and Chief Global Strategist, and she travels the globe to create new contacts and networks. Everyone at Blueye share a passion for the oceans and bring top professional skills to develop an underwater drone which will make everything under the surface accessible to children, youths and adults – and not least provide crucial ocean data for researchers. “The greatest bottleneck researchers face today is access to data which allows them to create models and say something about what is happening. We know changes are taking place, some are due to climate change, some come from traffic and pollution from humans. It is important to understand this better in order to take the best possible action,” says Christine Spiten. She is interested in monitoring ecosystems and marine species, but she also wants to see what kind of pollution they are exposed to. Blueye Robotics and Christine Spiten was among the companies presented at the 2018 Confederation of Norwegian Enterprise NHO annual conference ‘The Value of Work’. We met her at Mesh, The Nordic Creators’ Community, one of the first co-working spaces for independent entrepreneurs and startups in Oslo. This is where she wrote her master’s thesis on the market potential of underwater drones. After securing her Master of Science degree, studying international entrepreneurship at UC Berkeley, spending time at the Federal University of Rio de Janeiro in Brazil and working as an intern at Kongsberg Oil and Gas, she got in touch with the place she considers to be world-leading on underwater technology, the Norwegian University of Science and Technology in Trondheim (NTNU). They decided to join forces and approached two researchers at AMOS (Centre for Autonomous Marine Operations and Systems) at NTNU. Christine Spiten moved to Trondheim where the four entrepreneurs launched Blueye Robotics in the autumn of 2015. In 2017 the company counted 19, and aims to double that in 2018. Their first product is ready. Production of the underwater drone starts in the summer of 2018, and will ship in the autumn. They already have several hundred orders, and are working on new models which are at once more advanced and simpler. They all share the same digital platform which allows users to share videos and data collected by the drones. “In 2017 I have been travelling a lot. I have been to Australia twice and delivered a prototype to The Great Barrier Reef Legacy, which is doing research on the coral reef. They use the prototype for their expeditions. “There is a reason why we employ 19 people, development is enormously challenging; you’ve got hardware and software, mechanical design, control systems, electronics, and it is very expensive. As a group of four we had no chance of taking the project all the way, so ever since starting at the NTNU in the autumn of 2015 we have been on the lookout for the competencies we do not possess ourselves. Out close links to the NTNU have been very important. Clever people from around the world come here to recruit clever heads." They have also cooperated with Eggs Design and won several design awards with them. Christine Spiten delivered her Master’s thesis in the spring of 2015. Blueye started up that summer. One of the first things she did was to take off on a research expedition. She joined 13 other women and sailed from Senegal to Brazil. 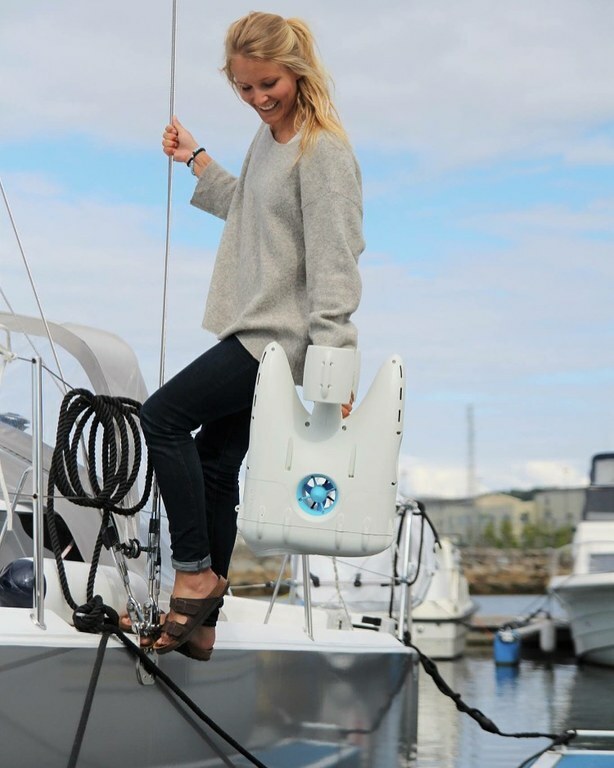 They crossed the Atlantic and brought the first Blueye prototype with them to map marine pollution along the way. “During the expedition we gathered data and took water samples which were later sent for analysis at the University of Georgia, where they are looking into the link between marine pollution and human health. We were sailing in an area where nearly no one has gathered data before, between two gyres in the Atlantic. Gyres are circular ocean currents where plastics and other waste gather. After the expedition, she travelled to the Paris climate summit to present experiences from the project and the opportunities an underwater drone presents as a tool to map and inform about the status of our oceans. The foundation means establishing a good company culture and an identity which all the employees are part of, understand and support. “That is how we do things. And everyone should know what it is, what the company stands for. Where we want to go. The company culture is coloured by openness and trust. As founders we have enormous trust in all of our employees. We have been working very fast with a global focus since day one, which means quite a few trips overseas. When the CEO, or me or one of the other founders are travelling to work with our partners or clients, we know the team in the office are working as hard as they can and as correctly as they can. Hurtigruten has expedition vessels taking guests around the world – to the Arctic, the Amazon, along the Norwegian coast. They also have expedition teams onboard with marine biologists who talk about vulnerable ecosystems. “Hurtigruten wants to offer guests underwater drones as an activity. They want to show live video of what is going on under the surface on the onboard screens, so that you can see and experience the world under the sea too. So for us it is exciting to work together with them. They travel to wonderful natural areas which few people ever get to visit. The underwater drones will go there too." The drones are equipped with a camera and powerful lighting. The more advanced models will also have several sensors which can measure temperature, pH and other parameters which are important for understanding what is going on in the sea. Have you managed to get past the obstacles often faced by entrepreneurs trying scale up their production? Christine Spiten wants innovation to serve society’s needs. Her advice is to use the 17 sustainability goals as a starting point. These days Blueye and the Norwegian broadcaster NRK are making a miniseries about looking after the oceans. An underwater park will open in Oslo at the end of February, where they will use underwater drones for filming. Christine Spiten and one of her fellow founders of Blueye are also on the advisory board of the research vessel REV (Research Exploration Vessel), were Nina Jensen, former head of WWF Norway, is the project leader.